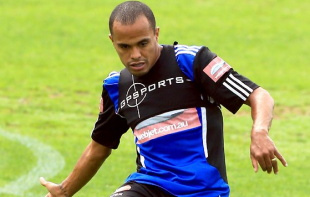 The Philadelphia Union announced on Friday the signing of 28 year old Brazilian left back Fabio “Fabinho” Alves. Fabinho will not be eligible to play for the Union until after the opening of the international transfer window on July 9. He could make his first appearance for the team on July 12 against Chivas USA. The 5’7″ 149 lb. left back last played for Sydney FC in the Australian A-League, appearing in 18 out of a possible 26 matches for 1,450 minutes. He last suited up on March 28, 2013, playing 62 minutes in the 3-1 loss to Brisbane Roar. In the 2011-12 season, he played for Melbourne Victory in the A-League, appearing in 23 matches. He has previous experience in Brazil with Volta Redonda (2011), Mixto Esporte Clube (2010) and Ponte Preta (2008-2009). Fabinho will join the team pending receipt of of his U.S. P-1 Visa, International Transfer Certificate (ITC) and will occupy an international roster spot. Per league and club policy, the terms of his signing were not disclosed. If this guy came on the cheap, this is a good signing. I don’t think that we should scrap Ray Gaddis though. The Union list him at 5’7, 149… Hoping we don’t have to see him as CB depth. He’s not CB depth; Williams is. By having this guy, they could play Fabio on the left, Gaddis on the right and slide Williams inside if they needed to. Sorry, terrible reading comprehension on my part there. If the two red cards in a shortened season are an indication, Ray would be getting plenty of playing time after suspensions for Fabinho. Let’s hope that he is able to help, and get that tendency under control. I still like the addition of help on the left back spot. I really hope that Ray Gaddis remains our starting LB, with Fabinho added for depth. Gaddis has developed well for us. Sitting someone, of his quality, would be a mistake. I haven’t been among the Gaddis detractors, but for him to succeed we need a true LM. I like this signing as well, even if for no reason than we have another natural defender on the roster. On that note, didn’t the Union brass say we ha depth, and are now saying we are thin? I am one of the few that feel that Gaddis HAS been successful. He has developed nicely, even with our lack of LM support. He had to make the switch from right to left (major adjustment process for a fullback). Gaddis faced some very tough players, during the process. He has shown a lot of promise and looks to be a player that will factor in the future of this club…or he gets traded for allocations. I agree. Ray has had difficulties playing on his left but I think that he is getting better. That said, I think that the competition between Ray and Shaenon, for RB, would not even be very close. Gaddis is a better player, in my view. Ray Gaddis is not better than Sheanon. I don’t know how/why that got started. Just because Ray runs more it doesn’t mean he is better. Williams just brings more to the table. Finally a smart signing, at least it seems that way now. Absolutely need a new defender. I wonder if it will take him 12 weeks to be match ready ala Kleberson! Or if he’ll get on Hackworth’s bad side and never even see the pitch! Why the Union scour the world for backups is beyond me, but at least we have something. Still waiting for them to spend some real cash on a quality starter. For the record, not a single comment above stated that anyone expected or wanted him to be an immediate starter. May just be in your head. I posted this earlier in the week, but it deserves a read. These are three comments in a row from the page. I’m not expecting too much. My big question that I hope someone asks Hackworth is if anyone from the team has actually seen him play in person. For a team to continually sign players that they haven’t actually watched play is maddening. Are you saying that this guy could be worst then lopez? Yeah, that’s something I mentioned to the guys the other day. You’re signing a guy who was rejected by his last two A-League teams. Australia’s quality of play is lower than MLS. So that’s not a good sign. I haven’t seen this guy play, but based on what I read, I’m not particularly optimistic about this guy. He’s probably coming in at a low salary, so minimal risk, but probably not a long-term solution here. this was a very bad signing.I’ve watched a few games of his when he was playing for melbourne and sydney and he was terrible! and i wouldnt say the a-league’s quality is lower than the mls. they are just nearly the same the only difference is that we have money to buy fancier names.